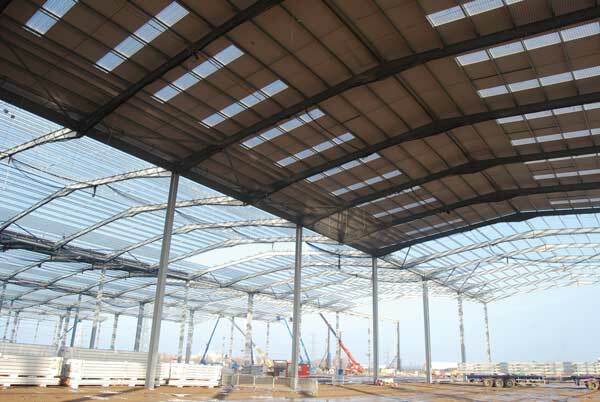 Requiring 3,500t of structural steelwork, a 111,000m² warehouse for retailer The Range being built at Central Park in Avonmouth is claimed to be the biggest single building in the South West of England. The enormous warehouse is being constructed by McLaren Construction for developer Stoford, with Caunton Engineering fabricating, supplying and erecting the steelwork on a design and build contract. With good transportation links and close to the Second Severn Crossing, the warehouse will bring 1,000 jobs to the region and inject millions of pounds into the local economy. Main contractor McLaren Construction started work on-site last year with an extensive piling programme kicking off proceedings. As the site is close to the banks of the River Severn, the ground contains soft alluvial deposits and a total of 16,000 concrete piles have been installed to a depth of 20m, in order to support the suspended slab, the steel frame of the warehouse and its internal racking system. To keep the programme on schedule, the construction sequence has been arranged so that Caunton Engineering erects the steelwork immediately behind the piling operation. The sequential operation is then repeated with the cladding and roofing contractors along with the concreting team installing the ground slab following on behind Caunton’s steelwork erectors. Overall the building measures 480m in length, which equates to 60 × 8m-wide bays. It has six spans of 36.5m giving the warehouse a total width of 220m.